In Feb 2018, we upgraded our original analysis of over 35,000 races (a life time of punting for most people, see below) to extend it to more races than anyone would bet on ever - across as many ways to choose your selections as possible. To view this graphic in a new page, click here. We also applied RewardBet to the "good result" that a tipping service reported on twitter. You can see here that RewardBet's staking increased the returns by 17 times - the type of staking that this tipper used is typical of many punters and it a major contributor to betting losses, although you may hit many winners. This popular tipster thought that a 2.8% profit on turnover (POT) was a good result for the day. However if they used RewardBet, they would have WON 17 times more! Many punters, we hate to report, bet haphazardly like this and their returns will be affected. Our original analysis over 35,000 races is below - the results are similar - RewardBet will help you #winmore. This analysis shows how much RewardBet can contribute to your additional returns. In this example over 34,000 races were analysed. We chose to take the top 4 selections in a rating system we were following. 1. As you can see, backing the top four for the Win provided a loss of -10.2% when they were equally flat staked. That's actually not so bad ... so although it was a loss, theoretically it should have been more (if using a pin) so the ratings used in this analysis do have some merit which is good to see. 2. 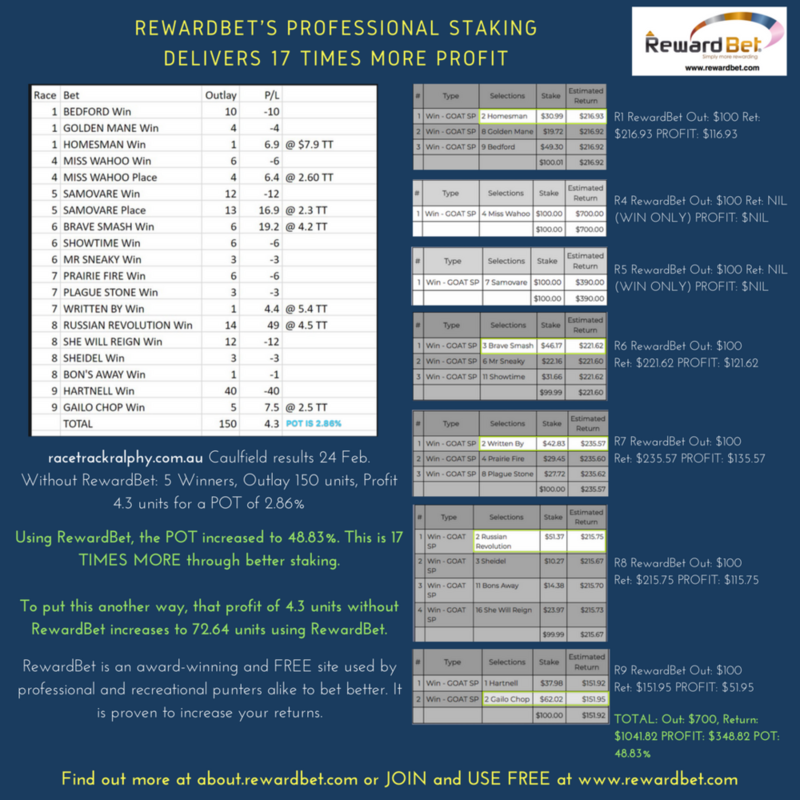 When RewardBet's staking according to price and probability was applied the additional returns were simply remarkable. Even with Win betting there was a 5% uplift in returns (albeit still a loss) but across the other bet types the increase using RewardBet's staking was sensational. These are the types of uplift that our customers see every day across their betting - we even show customers now in their 'My Bets' history what this uplift is - we call it the RewardBet Advantage. It's worth noting that across Greyhound and Harness betting the RewardBet Advantage can be even greater. The take-away is this: if you are NOT using RewardBet for your betting - from Win to Exotics - you are essentially robbing yourself and just adding more to the coffers of the professionals. It's as simple as that. Even if you are not an overall winning punter (and of course many aren't), RewardBet will provide you with more returns, allowing your bank to last longer and providing you more time to hit that great return you deserve. Time For Better Betting? - Join In Seconds! We took a series of 49 different ways (systems) to choose selections for a race (eg, using ratings, using top rated for win, using random selections, etc) and compared the returns for the same selections between non-proportional (flat staking) and using RewardBet's staking. Although not every 'system' was overall profitable, the increase in returns, is what is important. The raw numbers are: Total Number of Races Considered 456,828. Difference - Improvement 2.56%. Improvement Percent 16.18%. Difference - Improvement 3.35%. Improvement Percent 23.14%.